I first came to Bethel for a basketball camp before my sophomore or junior year in high school. I did not know much about Bethel or the MIAC. Since my basketball skills did not extend much beyond pushing people around under the basket getting rebounds and lay ups, the basketball recruiting visits never materialized. However, I did start talking with Coaches Johnson and Plinske about Bethel football during my junior year. Their passion for the game but more so for the development of faithful young men along with the character that I saw in the football players I met on my visits brought me to Bethel. What did being at Bethel do for you? Being at Bethel helped set the foundation for my adult life. Being a part of Bethel football played a major role in that development. Whether in Anatomy and Physiology, Introduction to the Bible, Environmental Writing or on the football field, my Bethel experience taught me that in order to have a real and authentic faith it needed to touch every aspect of my life. That is an ongoing process that I continue to strive for today. It is not an easy task and one that has its ups and downs but one that we are all called to press on toward as we seek to live out God’s call on our lives. I also had the privilege to come back to coach at Bethel from 2000-2004. 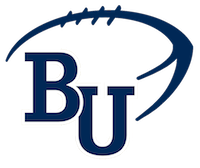 The opportunity to work with the coaching staff at Bethel gave me a greater appreciation for the passion and preparation that goes into everything from practice planning and film study to helping players grow into the men they are called to be. I am married to Joanna (Sahlberg) Hallstrom. We have a boy, Cai (8), and a girl, Solvei (6). We live in South Minneapolis. I am a captain with the Minneapolis Fire Department. I also work part time in my previous field as a physical therapist. How did your Bethel experience help you as a husband, father, co-worker? The foundation of a real and integrated faith that began to take shape at Bethel is what I try to build on as I fulfill my role as a husband, father and citizen. During my playing days at Bethel Coach Plinske and Coach Johnson would talk about not getting too high or too low based on our circumstances whether that was the situation on the field on a Saturday afternoon or in life in general. It is the idea of that steady climb that I have taken with me into the roles that God has lead me too. There have been highs and lows but through faith and the people that God has placed in my life I continue to strive to live in a way that honors God and loves and values others.